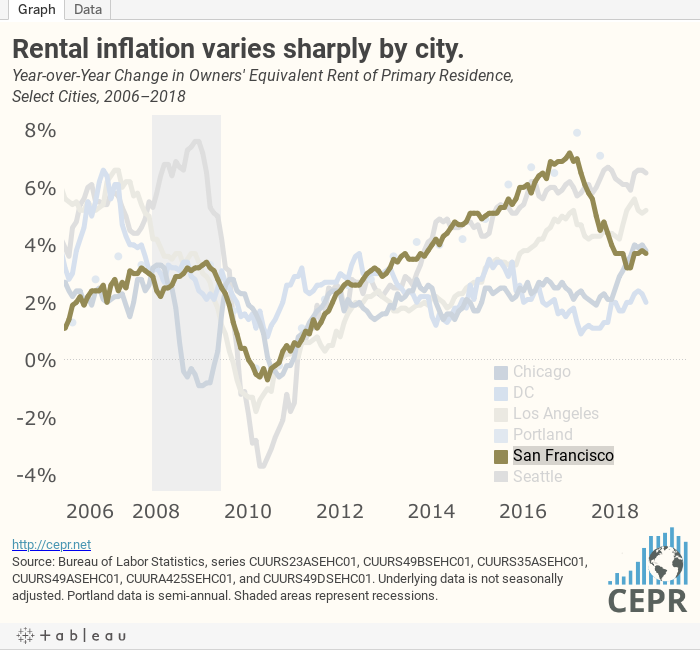 While there is little evidence of any slowing in the shelter index overall, there are large divergences across cities, and rental inflation has slowed sharply in some cities. For example, in Washington, DC, rental inflation had peaked at 3.5 percent in 2015. It is now down to 2.0 percent over the last year. In San Francisco it peaked at 7.2 percent in 2017. Over the last year rent has risen by 3.7 percent. By contrast, rent has increased by 6.5 percent over the last year in Seattle, little changed from its peak rate of 6.7 percent last year. Chicago is also now seeing rapid increases in rents, with a rental inflation rate of 3.8 percent over the last year. That is up from rates slightly over 2.0 percent in 2017. (These figures refer to owners’ equivalent rent of primary residence, which excludes the effect of utility prices.) For more, check out the latest Prices Byte.